Roubi L’ Roubi – Costume designer and creative director. Roubi has dressed some of the world’s most influential men and women and created collections for several heritage brands which included the sporting label Holland and Holland, and Huntsman of Savile Row. He is a member of the Costume Designers Guild (CDG) of Hollywood. His film credentials include 'Nina', featuring eveningwear period costumes for Zoe Saldana – the actress playing Nina Simone. He spent several years as Creative Director and co-owner of Huntsman of Savile Row before re-focusing on his work in costume design for film. 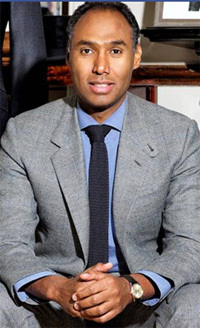 Prior to entering the trade, Roubi gained a degree in mechanical engineering at London’s Imperial College. This engineering background helped him develop an appreciation and understanding of form, fit and structure which he then put into practice working as a fashion designer. His academic training can be seen throughout his designs. Roubi believes in dressing appropriately for the occasion. His style which is classically simple in lines, has earned him recognition from his peers demonstrated when he was invited to judge the industry’s prestigious Golden Shears awards for young tailoring talent. Dedicated to the highest standards of excellence in men's and women's tailoring and country wear.